Expand Your Range of Applications Simple to Use Tare Function Place a container on the platform and press the Tare key. The tare is automatically stored in memory and the net weight is displayed during each subsequent weight. Easy-to-Read Rotating Display Choose a large, bright VFD (IGX models) display or a vivid LCD (IGB models) display to meet your application needs and ease operator reliability. For optimum viewing, and to help eliminate errors, the indicator head can be vertically adjusted with the turn knobs. 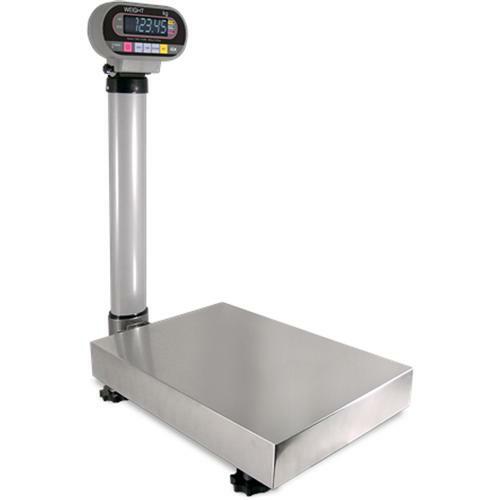 Checkweighing Function Simplifies Control When the user defined upper limit is exceeded, the letter "H" is displayed. When the value is under the lower limit, "L" is displayed. An audible beep warns the operator that the item is out of tolerance. Auto Power Off Function The IGB model features battery operation with a selectable automatic power-off function to extend battery life. For those applications where AC power is available, select either the IGB with optional AC adapter or IGX.